Keyworth Dramatic Society - the winners! The 43rd annual Keyworth Quiz, sponsored by the Keyworth Parish Council, ended after seven evenings, 27 quiz matches, and 1462 questions asked, with a 91-87 victory by the Keyworth Dramatic Society over Keyworth Guitar Club in front of a packed audience at the Village Hall. The Dramatic Society and Guitar Club were the two semi-finalists without a Quiz trophy win, but both reached the final, meaning there would be a new name on the Oakley Cup. In the semi-finals, the Dramatic Society beat Crossdale Drive School 57-49, and the Guitar Club had a 56-45 victory over the Allotments team. The final featured rounds on Keyworth Connections, the Blue Planet, a picture round, a Mastermind round and the usual 40 bell and buzzer questions. Our surprise round this year featured Jacki Davis, Jeanette Heesom, Audrey Dytham, Paul Hubbard from the Keyworth Ukulele Strummers playing six songs for the teams to identify. The Dramatic Society received the Oakley Cup and the Guitar Club received the Bailey Shield and individual cups were presented to the teams by long serving scorer Pat Jackson. The quiz organisers, Paul Turner and John Spafford, thanked the scorers, Anne Bellamy and Kath Oakley, and technical expert Chris Terrell-Nield for their attention to detail in keeping the Quiz running so efficiently. Thanks were also given to the 24 teams who entered and the ever appreciative audience who tell us that the Quiz is an invaluable tonic during the cold winter evenings. Over £300 has been raised during the Quiz for the village charity groups who serve the refreshments to the 750 people who attended the 2018 quiz run. Click here for full results summary. Entries are now being taken for the 2019 Quiz which will start on Monday 28th January. See below for the story of previous rounds. Monday19th March was Quarter Finals night at the Quiz and, as expected, four close matches ensued. The Dramatic Society were fourteen points behind the Tennis Club at one stage but a 24-10 turnaround on the Bell and Buzzer round saw them through to their first semi-final since 2013. 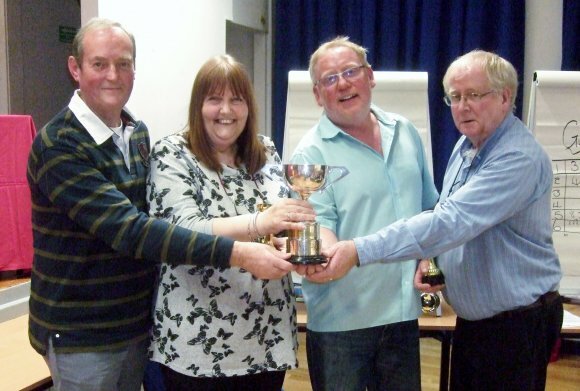 The Allotments and Methodist Church were the only two teams remaining who had won the quiz in the last 10 years. The Methodists struggled in the team and individual rounds but made a spirited comeback, winning the B & B by 26-19 but still falling four points short of catching the Allotments team. The third match saw a surprise victory as Crossdale School won all four rounds of their contest with the U3A Pals to achieve their first semi-final place since 2008. The Guitar Club and the Friends of Kadzinuni were separated by only one point going into the final round and it was the Guitarists who played their way into the semis with a 22-15 B & B victory. Week 5 provided four very competitive matches with two matches being decided on the final question. The first match was a repeat of the 2016 final and saw the U3A take a big lead after the first two rounds. Willow Brook won the next two rounds but were held off by the experienced U3A team. BGS and the Methodist Church were neck and neck throughout their match with the Methodist team making a late come back in the Bell and Buzzer round to win the chance to face the Allotments on the Quarter Finals. The Friends of Kadzinuni's knowledge of Places in Literature and faster fingers in the B & B round were the difference between them and the Scouts Uniformed Branch. The final match saw another close encounter with the Rugby Club coming back from a 15-point deficit, with Rob Severn in fine form on the B & B, but losing by just two points to Crossdale Drive School. We have 4 evenly matched quarter final ties on Monday 19th March starting at 7.30. Week 4 was the first week of the Second Round matches and saw the 2017 champions from South Wolds School beaten by the Allotments. Keyworth Abundance and the Guitar Club were equal 4th highest scoring losers with 44 points so played a 25-question bell and buzzer play-off match which the Guitar Club convincingly won. The Dramatic Society beat the Baptist Church in a high scoring opening match and the Guitar Club took advantage of their earlier play-off win to knock out the Turkey Trotters to secure a Quarter Final place. The Allotments and South Wolds were both in fine form with the Allotments coming from a point down after the opening 3 rounds to win on the bells and buzzers. The final match of the night was another high scoring affair with the Medical Practice defeated by the on-form Tennis Club. We completed the First Round matches with an exciting encounter between the Allotments and Willow Brook School. 3 times recent winners Willow Brook were beaten 59-56 in the highest scoring match of the Quiz so far but still progress to the Second Round as the highest scoring losers. In the first of the other matches, Keyworth Guitar Club were in competition with BGS for the third year in succession. BGS took a 2-1 lead in this individual contest with a 60-44 victory but the Guitarists live to compete again as equal fourth highest loser. The Tennis Club were once again appearing incognito, this year as leading women players. Captain John "Johanna Konta" Stansfield led his team of Wozniacki, Sharapova and Evert to a straight sets win over the Probus team. Keyworth United were making a welcome return with Luke Bateson, team manager of the Under 9 Whites, as captain. Unfortunately, they were outplayed on the night with the experience of the Dramatic Society on the bell and buzzer round stemming an attempted recovery from a difficult team round set of questions. The four highest losers were therefore Willow Brook on 59, the Friends of Kadzinuni on 49, the Baptist Church on 48 and Abundance and the Guitar Club on 44. The latter two teams will play a 25-question play-off quiz at the start of the evening on 26th February. The Second Round matches take place on the 26th February and 5th March, both evenings starting at 7.30pm. The second week of the Quiz saw the 4 winning teams all scoring over 60 points but two of the losers have a great chance of progressing as highest scoring losers. Our refreshments were provided by Leanne Hughes from the Keyworth Brownies. The first match saw the U3A Keynotes making their first appearance ever in the quiz and they were doing very well until the Turkey Trotters ran away from them in the bell and buzzer round to win 63-36. Keyworth Abundance were also making their Quiz debut and despite losing 64-44 to Crossdale could be one of the highest scoring losers after a strong showing. The third match saw two of the village church teams playing each other with the Methodist Church coming from behind to beat the Baptist Church by 61-48. With 48 points the Baptists could well secure a second-round place as a high scoring loser. The final match was between last year's winners, South Wolds School, and the Parish Church. The School showed the same prowess in the bell and buzzer round that won them last year's title extending their lead in the final round to win 61-39. 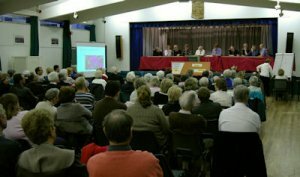 The 29th January saw the opening night of the 43rd Keyworth Village Quiz. An audience of over 100 people enjoyed 4 entertaining matches. The Quiz was officially opened by John Stansfield who has been the captain of the Tennis Club quiz team for several years. Thanks to John. The opening match was a high scoring contest between the Rugby Club and the Friends of Kadzinuni with Rob Severn's Rugby stalwarts pipping Nic Sellar's Kadzinuni team by 52-49. With four teams due to go through as highest scoring losers we would expect to see Kadzinuni in Round 2 with that score. The second match between the Scouts Uniformed Branch and the Keyworth Primary School was a lower scoring affair but equally close with the Scouts Uniformed Branch winning 46-42 despite a comeback in the bell and buzzer round from the School. Match 3 was a highly entertaining match between Godfrey Kent's Olde Peculiars and Chris Close's U3A Pals. U3A were highly fancied after being runners-up last year and due to the Olde Peculiars having never won a match in their long Quiz career. Godfrey explained that two of his team were expert quizzers and two were deaf; unfortunately, they are the same two people. But what a surprise as Godfrey's team after a poor start came back to take the lead at the start of the bell and buzzer round. There was to be no upset though as the U3A Pals got into their stride as the final round progressed and had a healthy 56-42 lead by the end. If this is to the be the Olde Peculiars' swansong, as they threatened, then they went out with heads held high. In the final match the South Wolds Sixth Form Students put up a strong showing against the Keyworth Medical Practice led by Dr Shroff. Both teams excelled in the first two rounds answering all the questions on Restaurants and Harry Potter but the experience of the elder team won through in the Bell and Buzzer round as they completed a 60-41 victory.